Yes they are open. I went there last week and the food is luckily as good as before but they were completely empty. They said they had to fix a lot of things in the kitchen and replace the floor. Everything else looks the same - even the sushi counter in the back and for some reason, they still have sushi on the menu. Got a huge delivery order from them and it was as good as ever. The mala in the bon bon chicken and suan la was intense. The twice cooked pork with scallion pancake is still one of the best Chinese dishes in town. We couldn't be more happy to have them back. I need to organize a meal here soon, so I can try more of their offal dishes that wouldn't deliver well, e.g. fei chang fen (vermicelli with intenstines), double fried pork intestines, and mao xue wang (tripe with blood cake). No more lunch hours for Chengdu Impressions. They open at 4pm every day. The web site has not been updated. Was in the neighborhood making a home depot run and finally had an excuse to try this place out (and not a moment too soon with some recent struggles from long-time delivery standby LSC Uptown). I wasn't able to put a huge dent in the menu but everything was pretty good. It's definitely drier than what i'm used to getting from LSC which is kind of nice but I didn't get the ma la for days some were talking about. Twice fried pork w/pancake was delicious comfort food but was a bit light in the heat department. Fu Qi Fei Pian was better in the ma la department but still a bit on the tame side, that said it was delicious and a much more generous portion than i've been getting from LSC lately. Pea leaves were good but suffered from take-out and drive home. We went to Chengdu Impression last night, and loved it. 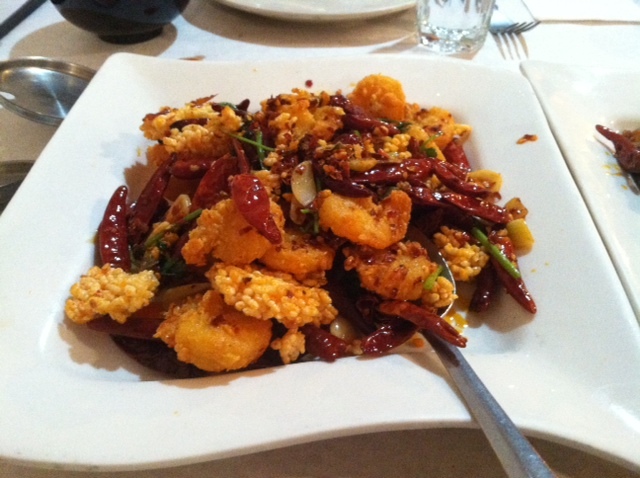 Authentic Sichuan food, yum! We were not very adventurous when choosing the appetizers, so let's just say that next time we'll try the Zhong's Dumplings instead of the Pot Stickers and leave it at that. We loved the main courses, though. The dry chili chicken was terrific - fiery hot and full of flavor, as good as the outstanding version at Ben Li's 8000 Miles, and without the excessive oil of the version at the Lao restaurants. We also had the shrimp with crispy rice. It was very good, too, but a bit too similar to the dry chili chicken; next time we'll try one of the less-spicy dishes (maybe the mayonnaise shrimp) to complement the dry chili chicken rather than to echo it. As an accompaniment, we had the excellent tiger skin peppers that Steve recommended above. Service was friendly, but slow at times; they seemed to have trouble dealing with a lot of tables at the same time. We arrived at 4:30 and had the place to ourselves. Numerous others arrived between 5:00 and 5:30. Of course, since this was December 24, it might not be typical of anything. As it turned out, 4:30 was also a good arrival time from the standpoint of neighborhood parking. The lot next to the restaurant and ostensibly available to CI customers after 5:30 was already full. (It belongs to the hardware store which had closed at noon.) The surrounding neighborhood requires parking permits after 6:00, so there was plenty of street parking available around 4:30. Bottom line - we loved the food at Chengdu Impression, and it's now our new go-to place for Chinese! Last edited by nsxtasy on August 19th, 2017, 9:01 pm, edited 1 time in total. We also did a holiday meal here on New Year's Eve with a friend and were very disappointed. They didn't handle the holiday business volume well at all. The wait for a table was long, but the wait for food to arrive was even longer (at least 30 minutes) and this was after they stopped doing takeout orders. However, the food itself also suffered. The bang bang chicken was dry and stringy, the suan le fan was fairly one note and skimpy on the noodles and the mei cai kou rou texture was not the springy pork belly I expect. However that may be because the interior was still cold. The pea shoots were still very good though. I am not going to give up on this restaurant since it was a holiday, but we left very dissatisfied. Think I've finally perfected my Chengdu order (for two). 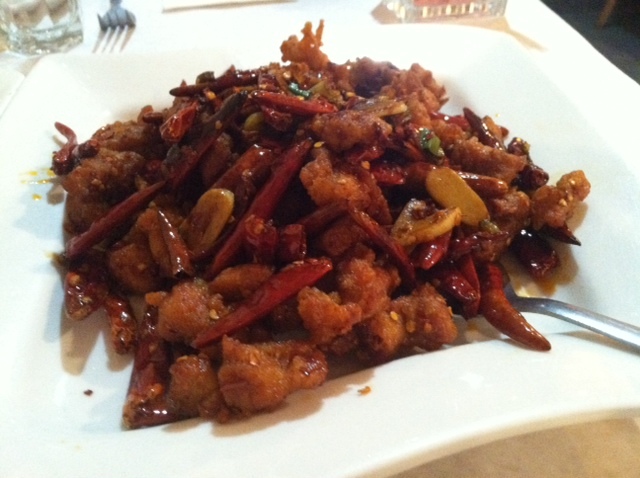 1 Order Tiger Skin Pepper $12.95 Quick stir fried fresh Chinese pepper with black vinegar. Very spicy. Lots of food; absolutely delicious, and the dishes balance one another extremely well. Probably my favorite overall take-out/delivery order in the city these days..
botd wrote: We also did a holiday meal here on New Year's Eve with a friend and were very disappointed. They didn't handle the holiday business volume well at all. The wait for a table was long, but the wait for food to arrive was even longer (at least 30 minutes) and this was after they stopped doing takeout orders. We tried to order through Grubhub on New Year's Eve. I checked the menu and created an order early in the afternoon but decided not to put it in quite yet. When I checked again @ about 6:30 they were no longer taking orders. We ended up with food from LSC uptown which was, surprisingly, VERY bland and disappointing. Ordered the Cumin Lamb for delivery. It was spicy, lamby, and amazingy. First note: they are NOT on OpenTable. There is a restaurant on OpenTable with the same name in California, and OpenTable doesn't tend to give you many hints that you're making a reservation two thousand miles away. Thankfully, they had room for us. Another Christmas Eve, another stellar meal. We ordered significantly more food than we ought (d'oh! there's leftovers in the fridge! ), even my 10-month-old granddaughter enjoyed the rice, egg drop soup and scallion pancake. Highlights included the always stalwart sole with tender tofu (love the crispy soybeans), Mei Cai Kou Rou (pork belly with preserved mustard greens) crispy eggplant (like little pillows of eggplant), sichuan wonton, a very crispy scallion pancake, smoked tea duck, crispy mayo shrimp. Less successful were the kung pao chicken -- it looked so right in the menu photo, but was gloppy and bland; and the xiao long bao -- nothing particularly wrong with it, just not amazing. 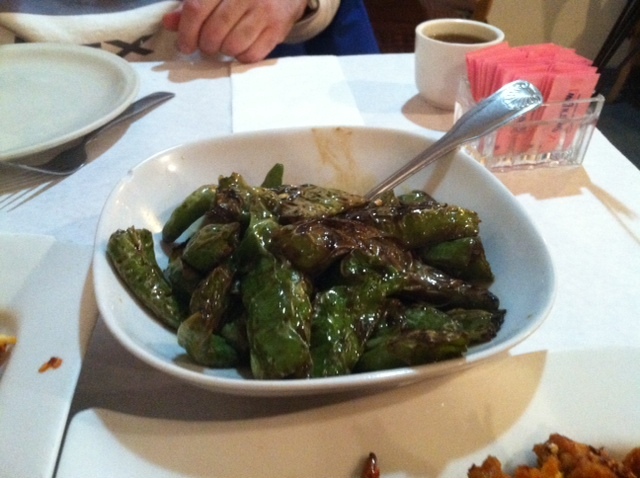 Only hiccup in the evening was not getting our sichuan string beans, but we were so full by the end we didn't insist. I do think they need some balance between sizes of dishes: the sole with tofu is an enormous bowl, and priced about the same as the crispy eggplant, which has only a few pieces of eggplant surrounded by inedible dried chiles. Has anyone dined here recently? Perhaps it was due to Lunar New Year, but last night I attempted to place a carry out order and their phone was either busy or rang unanswered for a long period of time during dinner hours. After striking out on placing a pickup order on Grubhub as well (said they weren't accepting orders), I drove to the restaurant to place an order. When I arrived I saw around 10 delivery service people waiting at the unattended front area, 1 or 2 servers walking around and a just over half full dining room. So I left without attempting to order food. Is this typical on a Sunday night? I did have a problem with a lengthy wait for a delivery order last fall and I would've hated to be one of those customers waiting last night for their delivery. So I guess my question is, are they short-staffed? I also wonder more and more how the growth of delivery/carry out orders affect the kitchens of restaurants. Obviously they are necessary for the bottom line, but when is it too much of a strain? Lerdawg wrote: Has anyone dined here recently? Six of us (plus baby) dined there on Xmas Eve. They were full, but service was fine and the food delicious.